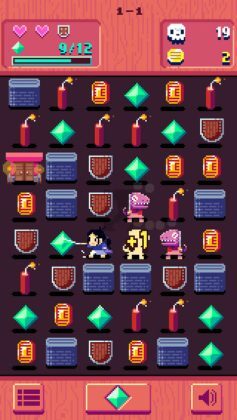 Today we would like to share our interview with the truly magnificent developers of this new and intuitive game, Swap Sword! 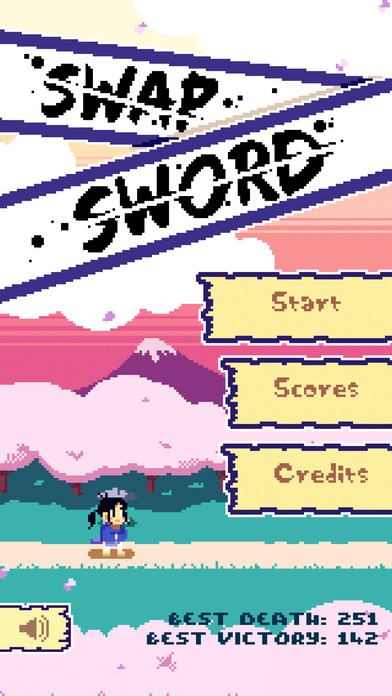 Read our review of Swap Sword here! Before we start, we’d like to thank AP and DG for participating in our interview, and for spending some of their valuable time answering our questions. Thanks guys! Ok first up, why did you decide to make Swap Sword? AP: It basically began as a prototype that I was working on just for fun. When I started prototyping Swap Sword, I had been working on match-3s for a while. The most prominent one was Beglitched which was released for PC/Mac/Linux in October. Since I had made so many, it was pretty easy for me to prototype a new match-3 whenever I had an idea. Probably the main inspiration for the game stemmed from the fact that I didn’t want to have to check if there was always a valid move available on the board, so I wanted there to be some kind of “default” move the player could always make. That led me pretty quickly to the idea of placing a player character directly on the board and allowing the player to always move them. Why did you decide to use retro style graphics when making Swap Sword? DG: I’ve been working in pixel art for years now — longer than I’ve been actively making games. I wanted to get into games because of things like cave story, canabalt, and super crate box, and many of my favorite games (for reasons that go beyond nostalgia) are classics — mega man 2, super mario 3, etc. Although certainly there’s a nostalgia wrapped up with pixel art, I don’t think of it as a retro style or even a style at all, but rather a medium that can hold its own in a contemporary landscape. There’s tons to learn from classic pixel art, but there’s also room to experiment with the expanded color capabilities of modern platforms and the expressive power of animation. I just wanted to animate the cutest lizards I could, so pixel art made sense. Actually, you are completely right. How on earth did you come up with the concept for Swap Sword? We’ve seen a lot of games which are “kind of similar”, but nothing like Swap Sword overall! AP: I enjoy a lot of the hybrid match-3 games that exist already (Dungeon Raid, You Must Build a Boat, etc.). I particularly loved Puzzle Quest when it came out for the Nintendo DS. Most of these games serve as a reminder that pattern matching (the primary activity in match-3s) is something that tends to be intuitively fun for a lot of people and exploring it as the primary verb inside a slightly different game (i.e. an RPG) is pretty cool. Despite how much I enjoy these existing games, I noticed a pattern where the action on the board (i.e. the matching) is distinctly separated from the additional play in the game (i.e. the RPG battles). 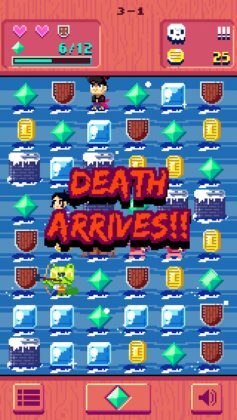 For instance, in 10000000 and YMBAB, the character running through the dungeon is almost in a different game world from that of the match-3 and the two spaces only communicate indirectly. Seeing this pattern, I started experimenting with hybrid match-3s where additional game elements are actually present on the match-3 grid. 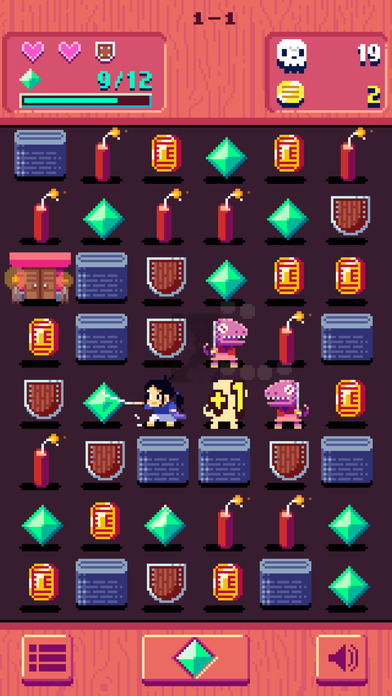 I explored this idea somewhat in Beglitched where the enemies are hiding underneath the tiles of the match-3 grid. For Swap Sword I decided to take this idea further by making both the player and the enemies not only be present on the grid but be part of the grid just like any other tile. What programming language and or software did you use when making Swap Sword? AP: I used Unity 5 to develop Swap Sword. I’ve used Unity for most of my recent projects and don’t have too many complaints about it. The sound effects were a combination of recorded samples, generated effects, and stock sound effects that we edited in Audacity. DG: I use photoshop for my pixel art, and it certainly serves my purposes pretty well, but if someone were just starting out in pixel art / animation I’d probably recommend something like aseprite or pyxel, or after effects / adobe animate for high-res work. Ok, here is a difficult question. What was the hardest problem you needed to overcome when developing Swap Sword? AP: The AI for the enemies probably caused me the most issues, mainly because all the enemies decide on their moves at the same time and need to communicate to each other where they plan to move to avoid conflict. 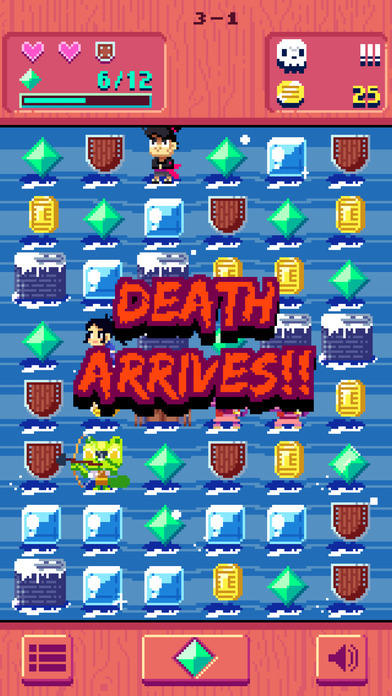 Given that some enemies move twice, some enemies move diagonally, and every time an enemy moves another tile has to be swapped for the movement to take place, there were a lot of headaches involving enemies who didn’t appropriately communicate what they had done to the state of the board which lead to tiles overlapping the same space when they shouldn’t. DG: I foolishly didn’t set out on Swap Sword with an initial color palette in mind, so deciding on colors for everything was a long and iterative process. When we started working on the 3-worlds, getting all of the different tile types and monsters to contrast against different colored backgrounds became really tough. I’d like to thank everyone at the NYU Game Center for letting me pester them with background after background for feedback, many with only slight hue or value changes. It was also tough to have an effective, mostly wordless UI that fit on all of the different device screens — space is at such a premium on the iPhone 4. 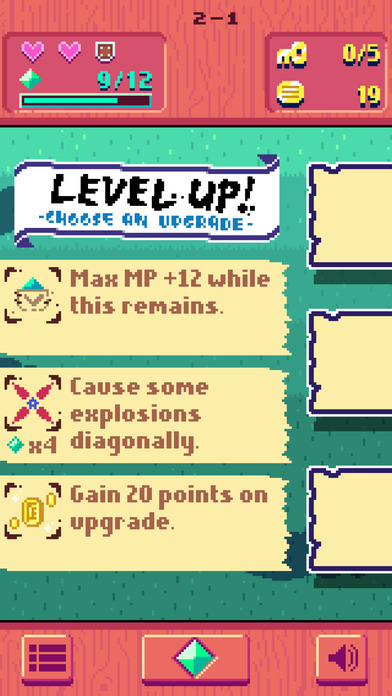 I think we could still polish the UI effects a bit — I’ve noticed that some players miss that you get points from slashing enemies. It’s important! AP: When I’m not actively working on a project, I tend to do a lot of prototyping, sometimes producing at least one game a week. When I’m doing this, I ask other folks for themes that I can use as an initial constraint when coming up with ideas (similar to how game jams work). Despite that, at any given moment, I might have different seeds of inspiration that I experiment with. With Swap Sword, the inspiration was initially purely mechanical and related to match-3s, but later began to include ideas from classic samurai films (specifically, Yojimbo and Sanjuro) that we watched as research. I often take inspiration from books, comics, mathematics, events in my life, and of course other games. DG: I read a lot of small press comics, watch a ton of tv and film. Less anime than I used to, but I still dip in and Ghibli is huge for me. But right now my biggest inspirations are my friends who make comics and editorial illustration — especially Sam Bosma and Kris Mukai. Both of their work has a sense of vitality that I really strive for in my sprites — Sam makes these amazingly detailed but still fun and beautiful worlds, and I think Kris is one of the best cartoonists around. I laugh at every face she draws. I’m also really into the work of Natasha Allegri. Otherwise, I get inspiration from my niece Isabel and jokes on twitter. A few words to Swap Sword fans on Edamame Reviews. 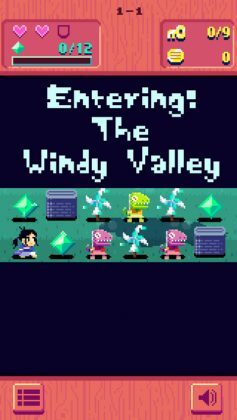 AP: I just recently released Beglitched (http://beglitched.net), but other than that my current projects are still in the prototyping phase and yet to be announced. DG: I am working on a secret project about beautiful birds and beautiful people. That, and I’m always dreaming about a sequel/sister-game to my 2012 browser game Ultimate Flirt-Off (http://media.radstronomical.com/flirtoffpublic.html). AP: You all seem great. Keep up the good work! DG: You’re good on your own, but I bet you’d be even better boiled with a bit of salt. Thanks for the amazing interview guys! That was one of the best of the best!